On a rainy day, nothing combats the weather like the taste of hot soup. Beef Chili: the meat-flavored cousin of Vikram's Three Bean Chili. John, Sandra, and I returned from a Safeway run only to be met with pouring rain. I immediately switched our lunch plans to making chili. 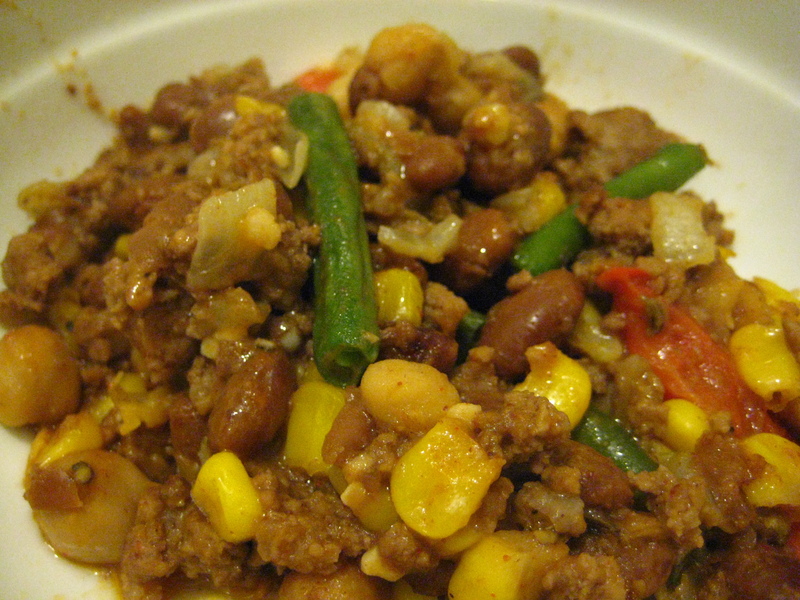 This recipe is a modification of Vikram S.’s three bean chili, which I originally made for a Foodie Friday last October. While Vikram’s recipe has a more sophisticated flavor that contains multiple bell peppers, a tomato base, and no meat, I just threw in the “right” ingredients until I was satisfied with how it tasted. I love making chili because it’s so easy: just prep your food and cook it in one pan. For prep, dice the onion, cut the bell pepper into strips (or squares, whatever you prefer); and chop the green beans into one-inch pieces. Defrost the corn, and open the cans of beans. Drain the beans if they’re not chili flavored–otherwise, your soup will be too watery. Brown the beef thoroughly on medium heat; season with salt and pepper. Then, saute the onions until slightly translucent. Add in the red peppers and the canned beans. Cook for about three minutes. Then, add in the corn and the green beans. Let the chili simmer for about 10-15 minutes, or until the vegetables are softer. Then, season with spices to taste. Serve with bread, cheese, or over rice.